The strong winds have dropped and Chew's incredible start to the trout fishing season continues! I fished with Rob Ratcliff yesterday and rose fish every drift in Herons Green Bay using Dries. The buzzers were hatching all day long - big ones - and the trout were feasting on them. I cannot remember when the trout have fought so hard on Chew and all of our fish were 3lbs and over. We had 2 cormorant damaged trout but no pike damage - I think anglers cannot tell the difference between pike and cormaorant damage and are simply labelling everything as pike damage. My friend martin Cottis did an autopsy on a 6lb pike he caught on a Diawl Bach Nymph and guess what it had been feeding on? Buzzer - it was stuffed with nothing but black buzzer nymphs, proving that the odd capture of a pike on a nymph is not a coincidence - these smaller pike obviously have buzzers high on their list of food. I also caught a 20lb pike on "black" Friday 13th May and it had one of my tags in it's dorsal fin rays. I have tagged over 300 pike since the start of last season and over 10% have been recaptured. Along with Bristol Water, this sampling enables us to check on the growth rate, recapture rate and movement of the pike. Incredibly, when I checked my records, it was caught on the very same day exactly 1 year ago by Mark Thompson and it weighed 17lbs 08ozs - just 2 1/2lbs weight increase in a whole year. This shows that the likely diet for that fish was roach and not trout. Over the course of a year, a big double eating trout at 2lbs average weight would have increased in weight by far more than a measly 2 1/2lbs! 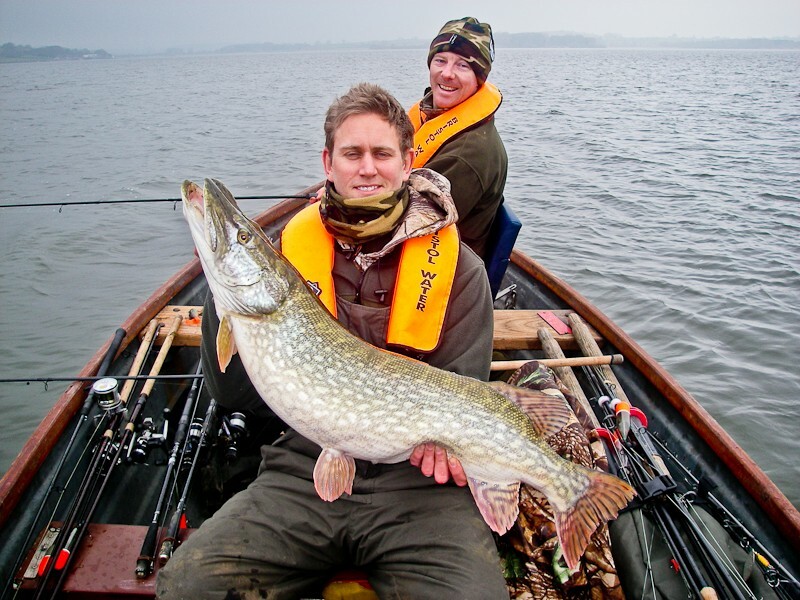 Those sadly misguided individuals who are blaming the pike for Chew's poor form in recent years, are obviously way off the mark A few years ago, they were blaming the cormorants whenever the fishing got hard - now it's the pikes' turn to carry the can! Friday 13th also heralded the first cuckoo on Chew this year. For me, this is a real sign that Summer is on it's way. I also saw a Hobby chasing insects in Villice Bay on the same day - so not such a "black" day after all! With the 10 day forecast predicting a spell of warm weather with light winds - the fishing could get even better. 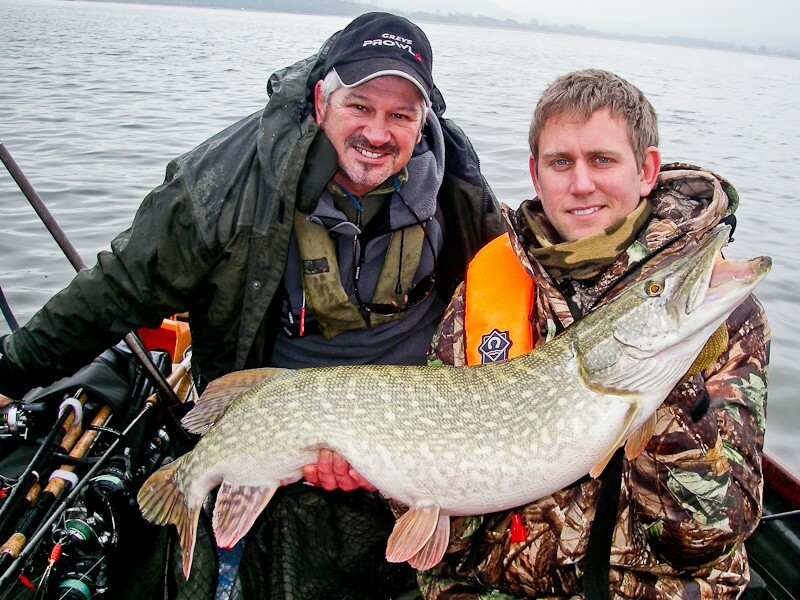 Chew Valley has now been open for a week and the action has been absolutely incredible. I have fished opening weeks for over 20 years and I can honestly say that this is the best I can remember. The weather has played it's part in a huge way - warm days to almost 20 degrees - very light winds - water temperatures of 11.5 degrees C - up to 8 feet of water clarity and most important of all - MASSIVE hatches of black buzzer. Since Opening Day on both Chew and Blagdon; all I have used is a floating fly line and a team of Buzzers and Black Diawl Bach Nymphs. At times, I have added a small Black Booby on the point at Chew to fish the "Washing Line" as the trout are so high in the water column, feeding on hatching buzzers and daphnia. On the 2nd day of the season, I put up a team of dries and caught my first dry fly trout of the season - take a look at the pic below and you will see the Black Hopper firmly nestling in the scissors - you might also notice that it has a cormorant mark on it's flank. There are still up to 100 cormorants on Chew and I have released 6 trout this season with cormorant scars - yet I'm still to catch a trout with a pike mark! I fished the 2nd day of the season with my good friend Barry Hawyes from Reading and as usual, we had a great day. 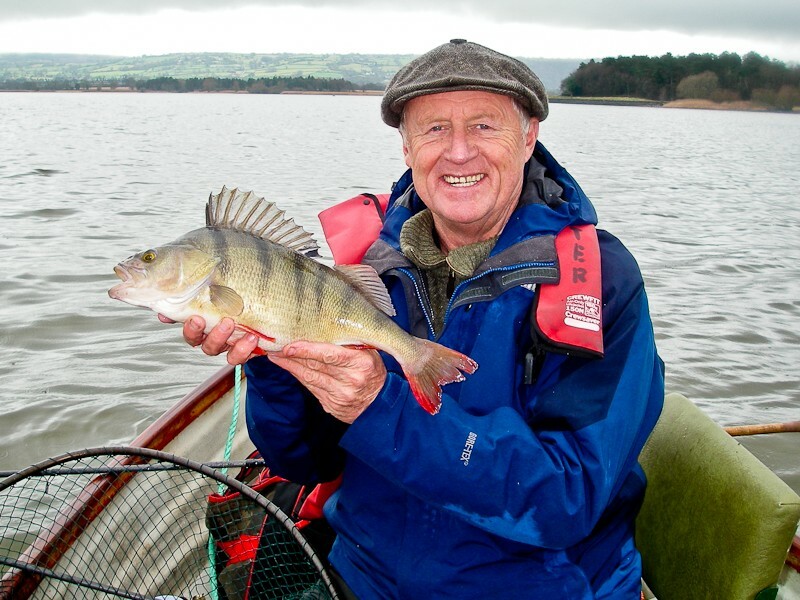 Barry started the day with a bang off Moreton Bank and quickly boated several cracking rainbows on Diawl Bachs and Crunchers. The weather was fantastic - flat calm and warm. We moved to the North Shore and the fishing got even better. We debarbed our hooks and fished catch and release for part of the day, finishing our limit bags at 4:00pm and making tracks early. What a day! The birds on Chew and Blagdon have been getting into the Spring spirit and Cettis Warblers can be heard all around both lakes. The Sand Martins arrived at Blagdon on 16th March and I saw my first Swallow at Chew 10 days later. Goldeneye are still plentiful, as are about 20 Shellduck that are feasting on the buzzers like everything else! No Hobbies yet, but plenty of Buzzards, Sparrowhawks and Kestrels. I am hoping an Osprey might make an appearance in the coming weeks on migration to Scotland. On Friday I am doing the first of my 6 "Free Days" for Bristol Water. Here, anyone who purchases a boat or bank ticket can have me for an hour or more - totally free of charge. These days can sometimes be pretty hectic, but they are really enjoyable and I get to discuss tactics, flies and methods with both boat and bank anglers - anything from fly selection to double-haul casting techniques. All you have to do is ring Woodford Lodge on 01275 332339 to book a session - maybe I'll see you on Friday!